Greenwood Landscaping is established in galway since 2000 and has grown steadily over the years. The company is owned and run by Herbert Schouten who has 25 yrs experience in the landscaping industry. Herbert's background and training originated in Holland where he had a very succesful landscaping company which is still thriving today. When Herbert moved to Ireland in 1997 he worked for three years in the landscaping sector in Ireland, until 2000 when he set up Greenwood Landscaping. Greenwood Landscaping offers a very high standard of workmanship and creative designs, all design work is done by Herbert. All projects are overseen by Herbert from the design stages to on site development and final completion. All our staff are highly trained profesionals and have years of experience within the company. 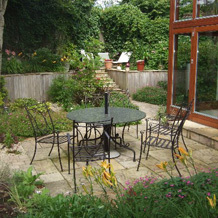 Herbert considers himself as a private garden specialist and therfore gets many happy clients and repeat business and referrals. Copyright © 2011 Greenwood Landscaping.